If you have bought a Gert VGA 666 VGA adapter kit (available here, £6.00 at the time of writing), here are some instructions for how to assemble the kit, and how to configure Raspbian to use the adapter instead of its normal video output system. 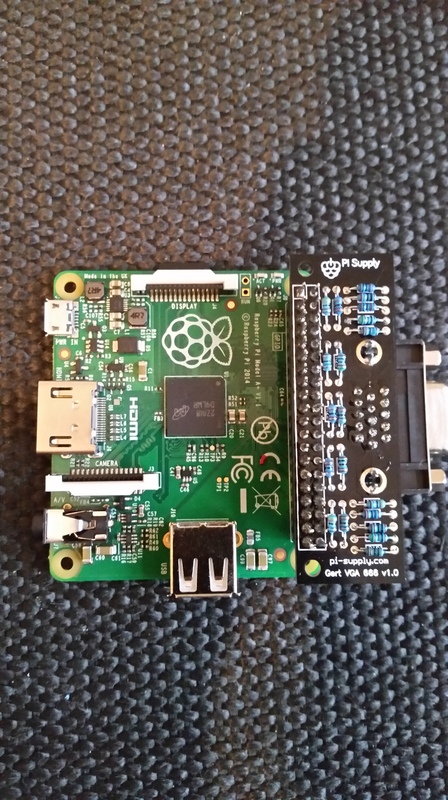 When you have finished soldering the board, you can plug it in and power up your Pi. The adapter won't work immediately, so you will need an intermediate solution to get video. If possible, we recommend borrowing an HDMI or DVI-D monitor. If this is not possible, and you only have a composite TV or monitor (the sort with with a yellow RCA input), you can use that temporarily. You will, however, need a special TRRS (4-pole 3.5mm jack) cable for this (see the pictorial buying guide for more information). If you only have an RCA cable, you can temporarily connect the cable directly to the Pi by soldering the video wire (inner wire) to a PAD on the bottom of the Pi marked PP24. The shield of the RCA cable needs to be soldered to GND, and you can use nearby soldered PP6 for that. Please note, though, that this can be difficult, and and it can be easy to damage your Pi inadvertently. Soldering to the board will void your warranty so only try this if there is no other solution and you are very confident in your soldering skills. However you manage it achieve it, when you are using composite video, you must "inform" NOOBS that you are doing so. Watch the ACT LED to see what happens when you boot NOOBS, and when booting seems to have finished, immediately press either the 3 key to get PAL (European ETC) or 4 key for NTSC (American) composite video. When you get video, DO NOT follow the instructions to make this permanent: if you do this, or the Pi will be locked into composite, and your VGA adapter might no longer work. If this does seem to have happened, hold shift during boot to get back into NOOBS, and press 1 to get back to HDMI video. Now you have booted up, follow the instructions below to install the necessary drivers for the Gert VGA 666 adapter. You will need an ethernet connection for most of them: simply plug in the ethernet cable you normally use to get an internet connection, and Raspbian automatically will use it. 2. You will have to disable the SPI and I2C interfaces, otherwise VGA666 will not function correctly. Use the Advanced options from raspi-config to disable SPI and I2C. 4 Now adjust the resolution for your monitor (see this post and this one for more information). For the VGA board use 'dpi_' instead of 'hdmi_'. Thanks to DirkS for the original writeup. Thanks for this, I've built my GertVGA adaptor and it works! Except, it drives the VGA monitor for most of the boot process then stops driving it and the screen goes blank before reaching the login prompt. Sadly it all goes dark too fast for me to see at what point in the boot process it stops working, I'm guessing that since I see something of the boot the driver software is working and my hardware is all OK, so something else is either making it go into an incompatible video mode or disabling the VGA output. Maybe some hdmi setting interfering? I just remember that I had the same problem when I forgot to blacklist i2c and spi. Going back over my instructions... another error. Blacklist needs to be with underscores instead of dashes. DirkS wrote: That looks ok to me. Edited with underscores: no luck sadly. Have trawled through everything I can think of on this SD card, removed the only thing I could think might cause an issue (simbamond, for the pi.gate.ac.uk battery power unit), but still no luck. Otherwise this one's pretty stock. Will keep at it. At least my few seconds of activity at boot tell me it works. thekeywordgeek wrote: Edited with underscores: no luck sadly. Do you see spi-bcm2708 and / or i2c-bcm2708 in the list with loaded modules (use 'lsmod'). i2c_bcm2708 is there, yes. And another look at the blacklist file confirms I have it there exactly as it appears, no typos. Curiouser and curiouser. Edit: I notice /etc/modprobe.d/raspi-blacklist.conf also tries to block the i2c and spi modules, though it does so with the hyphen rather than the underscore. Create a file '/etc/modprobe.d/<modulename>.conf' containing 'install <modulename> /bin/true'. And now I have a VGA monitor displaying the login prompt. I don't immediately understand what the implications are for the howto. Anything I should append or change? I was hoping someone would come along and explain exactly what the thing I did actually does, and thus whether it's a more general HOWTO thing or just something weird about my setup. Has anyone else made it work using just the HOWTO? thekeywordgeek wrote: I was hoping someone would come along and explain exactly what the thing I did actually does, and thus whether it's a more general HOWTO thing or just something weird about my setup. Yes, me. And I know of at least one other. I have not yet heard of anyone else *not* being able to do i the *normal* way. Do you use Raspbian with the standard kernel? Absolutely stock Raspbian, and constantly kept up to date with apt-get. It's been used for a few things, Python tinkering, the camera module, and the aforementioned battery PSU board. But other than that no kernel tinkering. Sadly I'm not on the same network as the Pi in question at the moment so I can't deliver any output from it. But I doubt it'll give anything unusual. I guess the method of killing the i2C module that I found is the kind if thing that would be a "useful to know if you have that problem" kind of thing rather than a "Must be in the HOWTO" thing. thekeywordgeek wrote: I guess the method of killing the i2C module that I found is the kind if thing that would be a "useful to know if you have that problem" kind of thing rather than a "Must be in the HOWTO" thing. For our case, it was not necessary to blacklist spi & i2c (as per original Gert's pdf manual). Verified & loop-tested on both RPi Model B+ and A+. Just received one of these today. I presume all of the resistors are NOT the same and I have to use the exact ones in the correct holes? The link given in the top post has details of the resistors. The colours are important. I agree that they can be difficult to read (which I why I prefer surface-mount with numbers on that I can read with a magnifying glass). If you have access to a multimeter you can use that to measure the resistance to work out which is which. Any news on software / firmware to support dual display (HDMI + VGA)? I might as well throw mine in the bin. mancity wrote: I might as well throw mine in the bin. Don't throw it in the bin, if all else fails you can mail it to me with a self addressed stamped envelope enclosed and I'll solder it for you. Don't skimp on the postage, I'm not going to pay for the privelidge of assembling it for you. I'd want to pay you to assemble it as well as p&p. mancity wrote: Is that a serious offer? You wouldn't want to pay my hourly rate, better to just send it and let me solder it for the fun of it. I'll send you a pm with contact details. I get a 'not permitted' error on the second part regarding the /boot/dt-blob.bin? I tried to carry on anyway and when I reboot, the screen comes on initially in low res and looks like it'll work, then goes black .